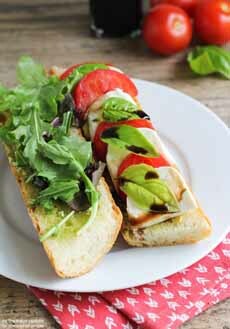  Caprese Sandwich on a baguette. Here’s a recipe from Somewhat Simple. Melt the mozzarella on a panini press! Here’s a recipe from Cooking Classy. Every restaurant menu we’ve seen this summer has Caprese Salad on the menu. That’s because July and August deliver the best tomatoes of the year, and a Caprese—tomato, mozzarella, basil and olive oil—will never taste better. First “discovered” on the Isle of Capri in the 1950s, Caprese Salad became a favorite of King Farouk, and then a summer dish at Italian-American and Continental restaurants throughout Europe and across America. Here’s the history of Caprese Salad. It’s so popular, you’ll even find Caprese Salad on winter menus—when the tomatoes are hard and have no flavor. We’ve since made Caprese pasta salad, Caprese pasta (topped with uncooked tomato sauce, ciliegine—mozzarella balls the size of cherry tomatoes), Caprese appetizer bites, Caprese cocktail garnishes and a Caprese with other fruits subbing for the tomato (mango, peach, watermelon). We’ve even made a vegan version with tofu instead of cheese, and Caprese gazpacho (blender tomatoes with shredded basil, topped with perlini (tiny mozzarella balls—the different sizes of mozzarella). But we’ve never made ourselves a Caprese sandwich—until now, because August is National Sandwich Month. Rub the bread with a cut garlic clove. Marinate the tomatoes with sliced sweet onions and oregano. Substitute the tomatoes for sundried, or roasted red pepper (pimento)—a good choice in the winter. Substitute pesto or arugula for the basil leaves. Grill the sandwich on a panini press. 1. SLICE the tomatoes and cover with olive oil. Add the garlic and season with salt and pepper to taste. Let sit for 10 minutes or more. 2. SLICE the bread (note: for a picky guest who didn’t like the “wet bread” from the balsamic and olive oil, we toasted the baguette and added a thin slick of sweet butter to the cut faces). 3. SLICE the mozzarella and drain the tomatoes. 4. 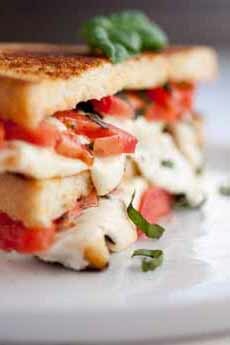 ASSEMBLE the sandwich: first the basil, then the mozzarella, then the tomatoes. Drizzle with balsamic glaze and serve. We love black olives, so we served them in a ramekin on the side.